In May last year I moved from Devon, where I was a social worker in a town called Newton Abbot, to join an older people’s team in south London. My job in Devon was busy, but it was nothing compared to my new role. I’ve had to adjust to a heavier caseload and a different, more target-driven approach to working. I have a very supportive team, and access to training, networking and supervision. But at times I have found certain areas of the job – such as certain forms and assessments or knowing which interview techniques to use – to be quite challenging. I know I’m not the only one – mental capacity is an ongoing learning curve for me and my colleagues have echoed similar challenges with various topics or casework. Towards the end of last year, I found myself wanting to explore and discuss these issues in a group where ideas could be bounced off one another. There is only so much you can learn from textbooks and theory and over the years since I qualified (in 2012), I’ve learned the best knowledge you can get is from other people and how they practise. In the past I’ve found it helpful to discuss a particularly tricky case or social work subject with colleagues during a lunch break. I know that we should have protected time for reflecting, developing and learning from one another, but there never seems to be any. I decided to set up a peer support group for my team, with the hope that a slightly more structured arrangement might be more successful. 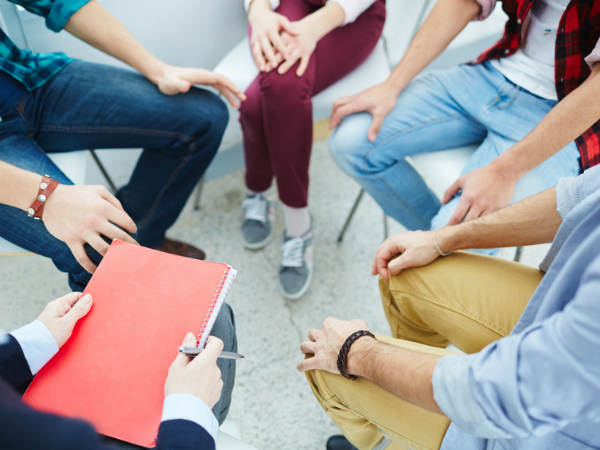 The group allows qualified and unqualified social workers to come together to talk about interesting cases they need help to explore, or that have affected the way they work and may help others to think or practise differently. They can also use the time to explore various social work topics, such as mental capacity and safeguarding. It took some work to get the group up and running. The idea was warmly welcomed, but many of my colleagues could not afford the time away from their caseload. The team manager therefore agreed that once a month the group would meet in the place of the weekly team meeting, which everyone usually attended. However – and this is key in my view – no managers attend. This seems to help people feel more comfortable. The group is not compulsory, but provides an opportunity to learn, share practice methods, reflect, or just to de-stress a little. In our first meeting we looked at the subject of mental capacity assessments. We looked at the assessment template, explored various capacity-related decisions, and shared capacity assessments we had recently completed to compare the different approaches. The aim was not to arrive at a prescriptive way of doing the assessment, but instead to learn new and alternative methods to improve your practice. While I expect to facilitate the groups initially, my hope is that it becomes a self-running, monthly meeting where people are able to come together and talk all things social work. I set up a peer support group for the team I am in. I pitched it to encourage group bonding, reflection time, CPD and a chance to feedback about work. My managers agreed it would take place fortnightly for one hour alternating with team meetings. No managers to attend and as a group we set our ground rules or principles and group objectives. Its been in place for about 7 months and we’ve covered many different topics, some specific to SW, others about staff wellbeing including mindfulness. We’ve taken brief minutes to help record CPD logs and really been able to get to know each other as a team. More recently its been decreed that every other session will be led by a manager and our group principles have been changed by a manager too. I hope your group retains its purpose and direction. That sounds amazing Liz. So good to hear another team doing the same thing. It would be interesting to know the impact on your group of having managers lead it. For us a key reason it works is because managers are not involved. This is a very encouraging story for those who want to set up reflective practice spaces. You may want to consider Intervision as a method for such groups. It is similar to reflecting team methods. At Goldsmiths where I introduced this method – it is used a lot in Switzerland – we have started using it on our BA and MA in social work and it is thought on the MA in Advanced Social Work (Practice Education). If you would like to know more please do not hesitate to contact me. Good luck with maintaining this valuable space. If you are interested just send me an email at Goldsmiths.